"An entertaining, yet highly engaging program to learn Hindi." Not long ago I signed up for the free trial of Rocket Hindi, which includes six days of online access to the full course. "Hindi is a challenging language to learn and traditional learning methods such as image recall have proved ineffective for many adults attempting to master the language. On the other hand, it takes a multi faceted approach to learning, combining games, quizzes, audio and cultural lessons to optimize language retention. If you want to learn Hindi for business, pleasure, travel, or personal relationship, you need an innovative, fun, and fast-track course to reach high proficiency." Does Rocket Hindi really work? Read on. There are 31 audio lessons in the audio section, each lasting approximately 20 minutes. The conversation is comprehensive, covering topics such as Greetings and Meetings, The Perfect Tourist, In Town, Food and Drink, Retail Therapy, Family and Friends, Activities and Hobbies, and more. The audio uses modern Hindi, teaching you useful colloquial everyday Hindi spoken by locals. Like all Eastern languages, correct pronunciation is everything, and a simple tonal slip can mean the difference between being understood and completely misunderstood. To improve pronunciation the Rocket Record tool allows you to record yourself speaking and compare the way you say things with the way a native Hindi speaker does. With the voice mapping technology you can record and repeat until your voice map matches that of the native host. Hindi is coupled with huge tradition and numerous customs that all foreign speakers should be aware of. 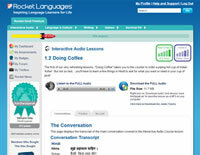 Rocket Languages has gone a step further than its rivals by including 31 Language & Culture Lessons that feature over 1000 embedded audio clips, activities, and extra vocabulary. This will give you insights into a wide variety of situations you're likely to encounter in a Hindi-speaking country, such as travel tips, getting around, bazaars, bargaining, beach culture, Indian rivers, greetings, Indian food, spices, hospitality, traditional costume, dialects, the Indian medical system, telecommunications, Bollywood, sport, Indian literature, the Vedas, Indian heritage, family, and more. Among many other features the course includes a piece of software called MegaHindi - word games that build your Hindi vocabulary and test your audio recognition of Hindi words. These interactive Hindi word games are a fun and effective way to reinforce your Hindi lessons. The games are self-paced and provide feedback in real time. The approach is two-pronged, with games for Hindi vocabulary and for audio comprehension. MegaHindi is accompanied by MegaVocab which covers over 1,000 words and 20 topics. Presented in Romanized Hindi, MegaVocab uses the standard system of English letters in a combination of capital and lowercase letters to represent the sounds used in the Hindi language. It also comes in a version that allows you to play in Devangari, the modern standard Hindi script. You can also add words and pictures to expand the library. Rocket Languages offers a comprehensive Hindi learning system that can be studied at your own pace, anywhere, anytime. All lessons are compatible with MAC/PC and all other digital devices such as iPod, iPad, Android tablets, and MP3 players. As standard you will be given lifetime membership to the Rocket Hindi Learners' Forum, where a team of Hindi teachers, native speakers, and fellow enthusiasts will answer your course and Hindi queries. You will also be able to email a teacher at any time for additional advice. Interactive, comprehensive and highly engaging way to learn Hindi. Dual approach - teaching language and essential cultural information. High-quality audio lessons (All digital platforms supported). Free trial access to full course for 6 days available. Lack of reading and writing coverage for highly advanced students. Rocket Hindi makes learning a difficult language fun and easy. The effective home study approach coupled with solid student support and an interactive learning experience will result in a faster obtained level of proficiency than a one-dimensional classroom approach, not to mention saving a huge amount of money and time. The affordability, innovation on traditional language learning methods, and comprehensiveness make Rocket Hindi my favorite choice. It's currently on special offer at just $99.95 (RRP $299.95).